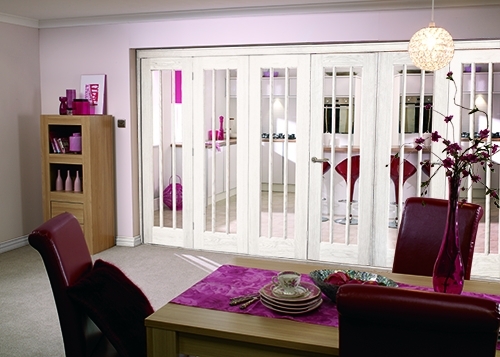 The Lincoln range of internal bifold doors is one of our most popular. Available in unfinished and prefinished oak as well as this attractive white primed version there’s a style to suit every home. The white primed bifold system is a very simple way of updating the interior look of your home. The brilliant white finish will help to make any room feel lighter and brighter, no matter what size or how much natural light there is. The vertical glazed panels allow plenty of light to flow from room to room. The reason bifolding doors are so popular is that they allow you to create a warm and cosy environment when you need it or open your space up to make room for friends and family when the party season comes around. Available in 3 – 6 door systems with either 2’0” or 2’3” doors, finding your perfect fit is surprisingly easy! We always recommend playing round with a few different sizes and style before deciding on the set for you. Your heart might be set on a three door system, but a narrower four door configuration may be much more aesthetically pleasing. All of our doors operate on a top hung system which means that there’s no need to install unsightly floor tracking which can get clogged with dirt and debris. Installation is incredibly easy as you are supplied with full fitting instructions, unfinished frame, hardware, doors, hinges and head track. The handles and drop bolts are down to you – to allow you to match them to your existing fittings.